People access Facebook at a cyberbcafé in Ho Chi Minh City. It is now more common for Vietnamese Internet users to express their opinions, objections or protests on social networks, and sometimes end up seeing the changes they have demanded really put in place. This can be evidenced by several recent headline-grabbing issues, which indicates that authorities are apparently listening to what their citizens discuss on Facebook or Twitter, and that social media currently have a certain say in Vietnam, which has been unfairly alleged to block social networks. Last month a plan to chop down 6,700 trees across Hanoi in three years was halted less than halfway through, seemingly following strong criticisms against it on both social and conventional media. Hanoi authorities had cut down only 500 trees when the capital city’s leader suspendedthe plan. Shortly after the tree-cutting plan was made public, a Facebook page was created, aimed at attracting 6,700 followers, equaling the number of trees set for the ‘massacre,’ to show protests against and call for an immediate cessation of the plan. The page was more than supported by Facebook users as it was quickly followed by over 62,000 people, who expressed their outrage at the plan, as well as fears that it would damage the city’s image. The Facebook page was believed to be one of the main causes that sent the city’s leader to make such a U-turn on its decision. Elsewhere in Ho Chi Minh City, a noodle stall has gained fame, and got back a seized sign, thanks to social media influence. The Bun Bo Gan stall, which sells Vietnamese noodle soup with beef, would not have been able to pique curiosity in customers citywide had its hilariously written rules sign and banner not been shared at lightning speed on Facebook. It was also Facebook users who strongly blasted a decision to seize the rules sign by local authorities, who said it had caused traffic disorder, referring to crowds of curious people reading the rules that ‘ban’ diners from “talking behind the store owner’s back” or complaining about his dish. The authorities later did an about-face to return the seized sign to the store and promised to sanction those who had taken it away. This, alongside the U-turn the Hanoi administration made on the controversial tree-felling plan, shows that authorities really listened to what the Vietnamese said on social networks. Vietnam had 11.22 million Facebook users as of February 28, 2013, ranking 22th in Asia, according to visualizing.info, a website that provides visualized statistical data. Startup-news website Tech In Asia said without citing any reference that the figure nearly doubled to 22 million, or nearly a fourth of the country’s population, in January last year. There are currently very few countries where social sites, such as Facebook and Twitter, are blocked. But it is apparently not the case in Vietnam, where officials at levels as high as the prime minister has spoken openly about the use of social networks. Prime Minister Nguyen Tan Dung has even ordered that authorities provide the public with official and accurate information in a timely manner on social media. “It is impossible to ban or prevent people from posting information on the Internet,” the premier said at a meeting in mid-January. “Tens of millions of people are using the Internet and social media, so we need to post the government’s official information on social networks,” he reiterated at the same meeting. A cabinet member, Minister of Health Nguyen Thi Kim Tien, also has her own Facebook page, whereas many state bodies in the southern province of Dong Thap are also communicating with members of the public via the world’s largest social network. Minister Tien made public her Facebook in March, and is now followed by about 147,000 people at the time of writing. The health minister sees her Facebook page as a channel to interact with members of the public, who have indeed urged her to supply timely assistance to those in need. Minister Tien asked the Hanoi-based Bach Mai Hospital to admit a two-year-old boy who was in critical condition over snakebite while his ethnic minority family could not afford to rush him to the hospital, according to her Facebook update on Monday last week. Last month, the minister also helped the daughter of a soldier who was killed in a battle against Chinese forces to protect Gac Ma Island, part of Vietnam’s Truong Sa (Spratly) archipelago, in 1988 to get a job in the north-central province of Nghe An after being told about her case via Facebook. Minister Tien also received many Facebook comments that informed her of people who needed medical aid, and she then assigned relevant agencies to handle the cases, all of which were made public on her social media channel. 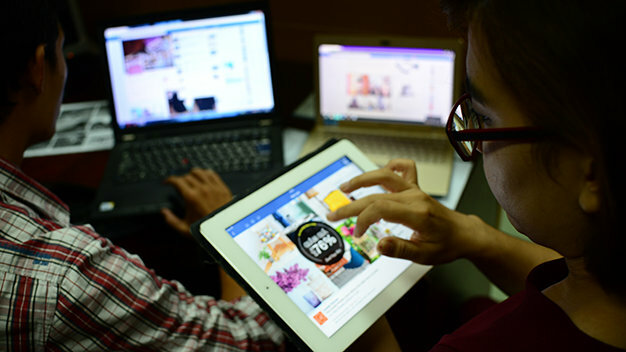 Local newspapers and media agencies in Vietnam also enthusiastically embrace social media, as most of them are interacting with their viewers, readers, and audiences via Facebook. VTV, the national television station, is running many programs that encourage viewers to interact via the shows’ Facebook pages, such as “Bua Trua Vui Ve” (Happy Lunch) and “Chung Cu 22+” (Apartment Building 22+). While watching the programs, viewers have the feeling that they are participating in them by helping guest players answer their quizzes through their smartphones or computers, and take photos and post them on the shows’ Facebook pages to win gifts. At the time of writing, Tuoi Tre News has nearly 15,000 readers engaging with it via social networks, with almost 8,000 followers on Facebook. If you are not one of these, like us on Facebook or follow us on Twitter to get the latest news about Vietnam!